National League side Cheltenham Town have signed goalkeeper Jonathan Flatt on a one-month loan deal from Wolves. The 21-year-old will replace on-loan Charlton keeper Dillon Phillips, who will miss at least six weeks after tearing a medial knee ligament. 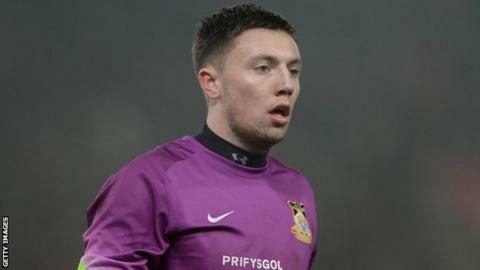 Flatt has yet to make his debut for Wolves, but featured in five games on loan at Wrexham last season. "He's a good lad and he's known by a few of our lads as well," manager Gary Johnson told BBC Radio Gloucestershire. "Dillon's been fantastic for us, and that's the disappointing side of it that you wanted him to be part of the end game. "If there's a miraculous recovery come the end the season, then there might be a few games for Dillon." Cheltenham are one point clear of local rivals Forest Green Rovers at the top of the National League table.